In the last year alone, the world has seen an enormous amount of attention focused on blockchain and cryptocurrencies. The lure of impressive returns has attracted a wide variety of investors. The ability for mining machines to be installed by everybody from average home owners with a single unit, to corporate operations filling acres of warehouse space has proven to be a popular challenge for many savvy investors. The challenge is supplying enough energy to these surprisingly demanding machines at a rate that still affords a return on the investment. This CBC article exposes just how much energy crypto mining is estimated to be using now and into the future. The best educated guess is that these mining machines are currently consuming approximately 70 TWh of energy per year. Crypto mining is just in its infancy and already the industry is consuming almost the total 82 TWh of electricity generated by the entire Provice of Alberta in 2016! Clearly supplying the energy to all these mining machines is going to be a major challenge for both Crypto miners and the power grid that serves them. So, why is a lil’ ol’ solar company in Alberta discussing this topic? We have actually designed and installed solar PV systems for clients in the crypto mining industry and it has become clear that Solar power can make energy intensive industries like crypto mining more profitable and take stress off the Power grid. For this particular system example, the cost to operate this mining operation would hve been over $7,500 a year…at today’s prices! In 10 years, the same consumption would cost $9,865! By installing a solar system, costs are reduced immediately, but so is future inflation. 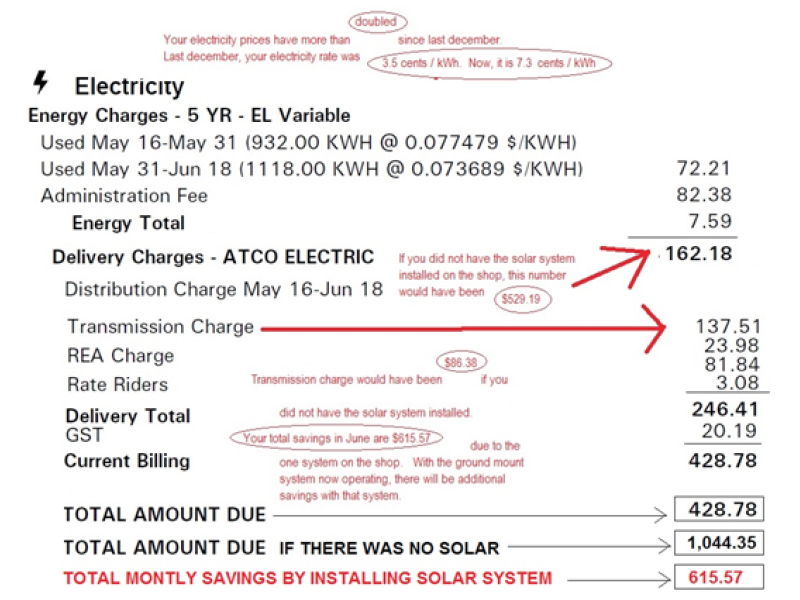 Below is a quick look at the electric bill for this operation and it is crystal clear that utilizing solar to off-set crypto mining costs is worth the investment.. When the mining machines were first commissioned in March of 2018 we can see the power consumption more than doubled! We launched the solar PV system near the end of April, which resulted in a slight reduction of consumption billing for the remainder of April. By May and June, we can see an absolutely drastic reduction on consumption billing, and by June 2018, the client had reduced energy purchases from the utility by 400%! This translates to a significant reduction in costs, saving the client close to $8,000 in the first year. The addition of solar power into this investment not only saved close to $8,000 of operating costs, yielding a higher rate of return, but it also helps temper inflation by mitigating increases in distributed electrical prices. I’d say Solar became a pretty wise investment! So, as we see this new mining technology placing a demand on your electricity systems, solar can clearly help meet the energy needs and help reduce operating costs. We hope you enjoyed this blog post! We always enjoy any constructive comments or If you have any specific questions, or would like to discuss a specific topic, please contact us!